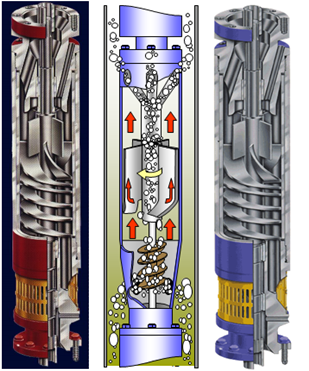 As the name suggests “ Pump Intake ” is where the well fluid enters the Submersible Pumping System. 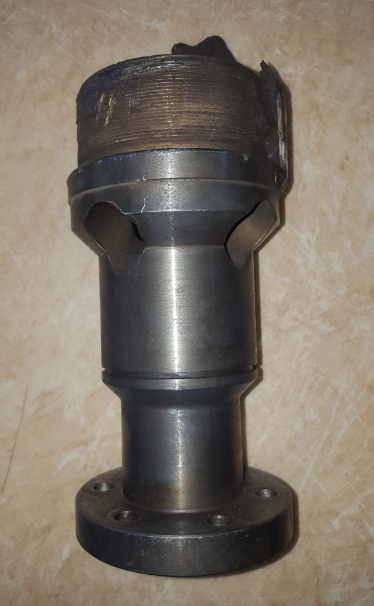 Care should be taken when designing a submersible pump intake because it is such a vital point in the system that when not designed properly may create all kinds of problems. Gas Separators (static and rotary gas separators). 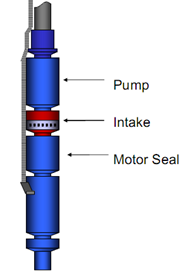 Usually, the pump intake is a separate component that bolts onto the bottom of the pump section. Occasionally, the pump is built in either a lower tandem or single configuration. In these cases, the pump intake as an integral part of the pump assembly. Gas Production has been a “problem” since the early days of oil production. It limited production on many oil wells producing with pumps. A gas separator is still an intake, but with some special features designed to keep free gas from entering the pump. There are two types of gas separators being utilized by the industry at this time. 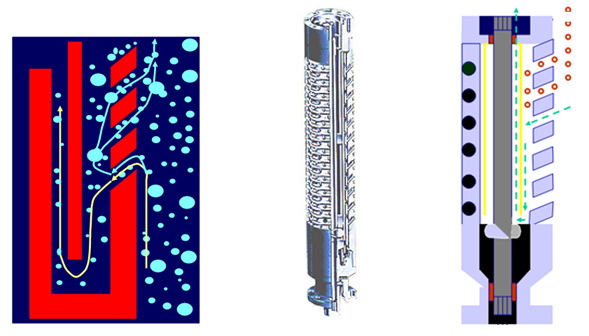 They are “static (reverse flow) gas separator” and “dynamic (rotary) gas separator”. Original gas separator designs were based on increasing gas separation by forcing the fluid flow to reverse in the well-bore. This is where the name of this type of gas separator, Reverse Flow, comes from. Since this type of gas separator does no real “work” on the fluid, it is also called a “static” gas separator. As well fluid enters the gas separator it is forced to change direction. Some of the gas bubbles continue to rise instead of turn or rise inside of the gas separator, exit the housing and continue to rise. Reverse flow gas separators are highly dependent on annular area, fluid velocity, and relative specific gravity of the gas and liquid. It usually separates up to 20% (by volume) free gas. PS: Reverse flow gas separation can also be accomplished by a shroud unit in wells of sufficient diameter by setting the pump below the well perforations with proper motor cooling. Dynamic is defined in the dictionary as “Force Producing Motion”, which implies that this type of gas separator uses force. The rotary separator separates free gas with an efficiency of 75% to 90% under most conditions. It should be used where the free gas available at the intake exceeds 20% unless there is abrasive material in the fluid. The rotary gas separator design works in a similar fashion to a centrifuge. It utilizes a specially designed rotating chamber (rotor), paddle wheel, or induced vortex to impart centrifugal force on the fluid. The rotor or induced vortex forces the heavier fluid to the outside & allows the free gas to migrate to the center of the chamber and exits through the discharge ports back into the well. Gas separator assemblies are often connected in tandem to improve the overall efficiency in high gas applications. NB: Do not design or operate a gas separator under a packer or where the casing is not vented. 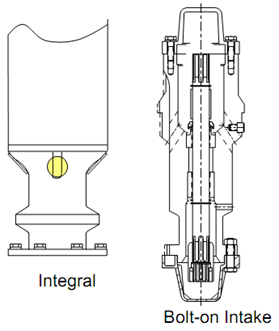 Solids can cause catastrophic failure of separator internals. Tagged artificial lift, baker hughes, BOI, bolt on intake, compression pump, dynamic gas separator, electrical submersible pump, energy, floater pump, gas separator, General Electric, impeller types, Integral, ISO standards, Mixed flow impeller, oil and gas, Petroleum engineering, production engineer, production optimization, production surveillance, production technologist, pump, pump shimming, radial impeller, Reverse Flow, schlumberger, Standard Intakes, Static Gas Separators, vortex. Bookmark the permalink.